A vast playfield is provided to give due importance to physical fitness and train students in various games. The volleyball, basketball, throw ball and an indoor shuttle courts add glamour to the sports activities. 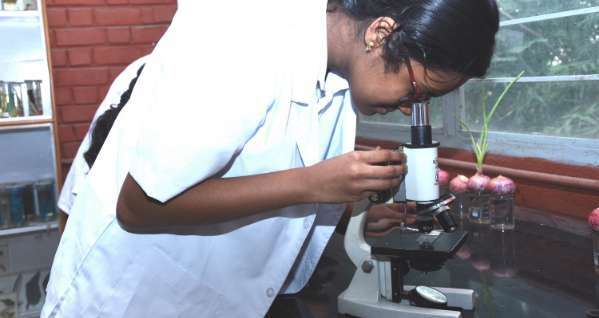 Well-equipped laboratories for different subjects like Physics, Chemistry, Biology and Maths to kindle the student's creativity, forms an integral part of the educational scenario to higher education.The school has equipped Physics, Chemistry and Biology labs which allow students to perform various practical's as per CBSE guidelines. Every classroom is introduced to smart way of learning with the help of smart boards where lessons come alive and no doubt this has made learning more interesting and easier. These Boards are equipped with vast contents related to all the subjects. There are spacious rooms available for Art, Yoga, Taekwondo and Chess. The school has a well-planned auditorium, which provides a platform to nurture the budding talents. The students are encouraged to participate in the Assembly, which is conducted everyday. The latest addition to the school's infrastructure has been this center with state of the art technology. It has a capacity to seat 200 students at a time and an acoustic design which creates an atmosphere of a modern theatre.A state of art multimedia enables to conduct various workshops for students in a smooth manner.